Over the past few years, there has been a gradual industry-wide shift from external collection agencies to internal revenue management. When aging receivables process is well-managed, the accrued benefits can be significant. Etactics Inc. provides clients with the ability to identify the appropriate A/R resolution and recovery through the cloud with A/R Insite™. A/R Insite™ allows customers to define, track and refine all vital processes and use them to assign work to team members via our Automatic Receivable Ticket System. The system allows for complete flexibility and customization. In addition to defining the steps of the process and a responsible party for each, extensive instructions can be added to ease training and onboarding of new employees. The Ticketing system is then utilized for traditional Recovery efforts and internal Project Management. A/R Insite™'s interactive KANBAN board interface allows an organization to optimize and manage accounts receivable workflow. Supervisors are able to physically see and review the current status on any AR activity or project. A/R Insite™ provides all clients with innovative Adaptable Templates that ensure fair practice, accuracy when collecting information, and the ability to take notes when necessary. Since 2002, it has become increasingly important to ensure that your organization's accounting department is conducting fair practices which can be ensured by utilizing A/R Insite™'s Adaptable Templates. Furthermore, collecting data has never been easier. Adaptable Templates allows users to know exactly what they are looking for when they need it, which in turn increases productivity. 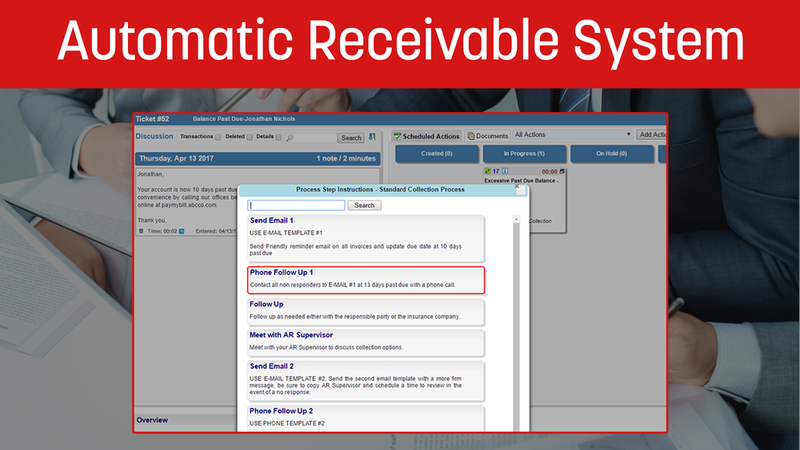 A/R Insite™'s Automatic Receivable Ticket System let's you and your employees track all accounts receivable processes every step of the way. 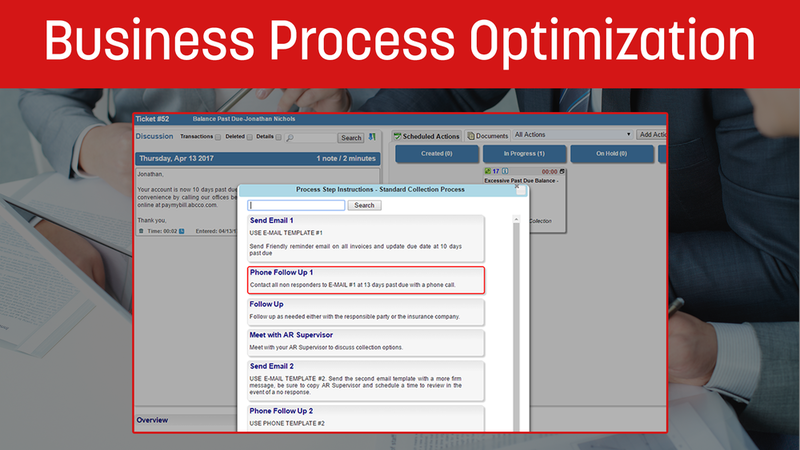 Each process that's created within A/R Insite™ will have step-by-step instruction explaining how you want your process to be completed. Once you or your employee has finished the specific action step, they can move on to the next step only after they've provided their detailed description on how they completed that step and have provided the time it took to complete that step. Take your spreadsheets to the next level: Sort by balance due, date of service, customer or any criteria you wish. Further enhance your workflow with inherent search, ability to view all past communication, jot down a quick notation, schedule a next action, or close out the receivable ticket. What are you supposed to do today? With A/R Insite™ you will receive instant access to utilize the automatic action bar. All of the planning is completed for you and your employees, all you have to do is open it up and begin your day. 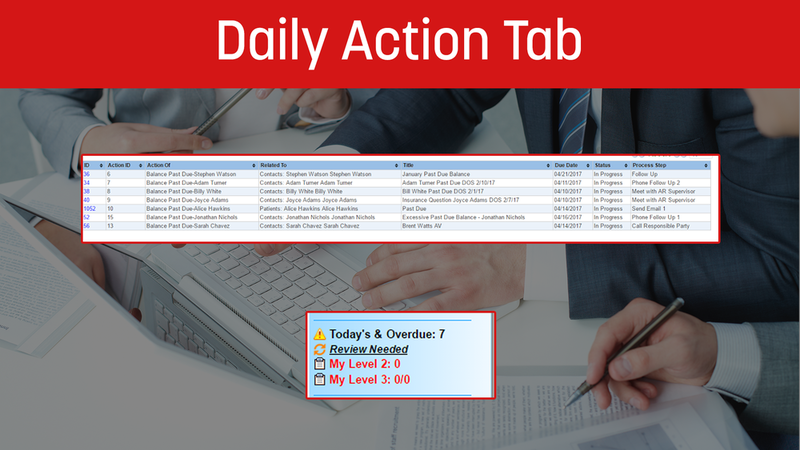 The Daily Action Archive is fully-adaptable to your needs, allowing you to make personal touches throughout. Quickly record your efforts and move on with the rest of your day.